Our company is a leading partner and a representative office of manufacturing company STALART sp. z.o.o. ( POLAND ), for the Czech and Slovakia markets. STALART company sp. z.o.o. is a licensed exclusive producer of SCS skeleton building constructions in Poland since the 2007. 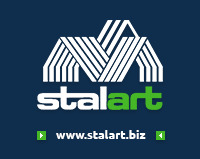 In the central Europe region, STALART is an supplier of skeleton building systems SCS in profiles of C90 and C140 for building companies from Ukraine, Scandinavian countries to Great Britain where these structures are used both for new buildings and for renovations, loft conversions, structures for floating houses, etc... This system is suitable for building of energetically efficient ( cost saved ) buildings, especially for law-energy houses and conversions. Thanks to low weight of the completed building, this technology is determined for building of floating houses, hausboats, superstructures of buildings, up/down floated houses in flood areas, etc... The emphasis is put especially into precision, quickness, efficiency of building and consequent low operational costs of the completed building. Building process with a STALART SCS system does not require any so called ´´extraworks ´´. Therefore, investors can rely on high precision and compliance with the cost estimate and the delivery date of each phase of construction, counted only in days and hours. Construction of supporting system as fast and precisious alternative to welded structures is also remarkably important possibility. STALART SCS profiles can be used even as load-bearing structures of the inner fitting of bars, receptions, portable tables, benches and designer furniture. Simply said, it can be used wherever where a high load bearing capacity, the possibility of dismantle and a large surface (e. g. to make the texture of rock foils ROCKFOIL become apparent) is a priority.